Get an Xbox One X Fallout 76 Bundle for $469! Microsoft Microsoft Store: Xbox One X 1TB Fallout 76 Bundle + Gears of War 4 Digital Code $469.00 (regularly $599.00) Get an Xbox One X Fallout 76 Bundle for $469! 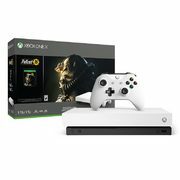 Get your hands on the most powerful Xbox ever with this deal from the Microsoft Store, because you can get an Xbox One X 1TB Fallout 76 Bundle in Black or Robot White, along with a Gears of War 4 download code for $469.00 (regularly $599.00) with free shipping, for a total savings of $130.00! While Fallout 76 has received mixed reviews, the bundle itself is a great value for anyone in the market for an Xbox One X and marks a new historical low price for the console. For comparison, other bundles are currently $599.00 at the Microsoft Store, while a standalone Xbox One X without any games is currently $599.99 at Best Buy. Plus, the Gears of War 4 bonus is a Microsoft Store exclusive and adds a value of $29.99 to the bundle. This offer is available online or in Microsoft Stores until March 31. The Microsoft Store offers free shipping on all orders with no minimum. Spec wise , is the Xbox one x better than ps4 pro? Same price at Amazon. Guess they're having trouble moving these since the game is supposedly garbage. Pretty sure it is, Spec wise. But I guess it all depends on what games you like too, as most people agree Sony has the better exclusives. Hardware wise yes it is. Mixed on different games playing better on either or right now. XB1X will play 4K movies though, so that's a win. Playstation currently winning exclusive battle though. I bought a One X on Black Friday and I'm really impressed with it to be honest. I came from a base model PS4, but the difference in, for example, Red Dead 2 to the base PS4 is night and day. Smooth animations, framerate, and 4K. In short, after skipping the XboxOne completely until now, I'm glad I've jumped in at this point. Great selection of games too, especially with Game Pass which is a great bargain and some un-missable games on it. hopeing for a 200$ one S bundle! When you think of it...at this price it's only $90 more than a regular PS4....which is kinda crazy..
Good price even if you decide to throw the game away. Yes and cross-platform games generally runs better on the XB1X, such as RDR2 and Kingdom Hearts 3. Same price at EBGAMES. IF anyone has any trade credit left there. Thinking about trading in my one S and PS4 for this, then buying a pro later on.